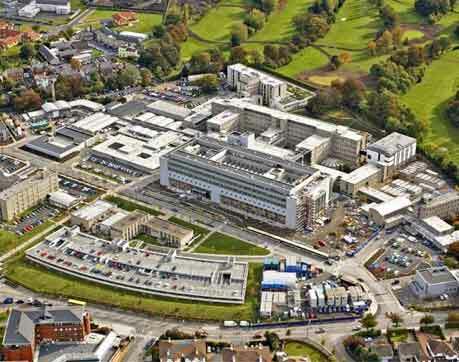 Patient care is the number one concern of St. Vincent’s University Hospital (SVUH), the major academic teaching hospital in Dublin. As digital voice recorders were nearing end of life at SVUH in 2008, technical staff realized the need to assess options for dictation. At the same time a newly designed outpatient building was constructed providing each consultant with an individual telephone. After an extensive tender process SVUH chose the TA+ System because of Arrendale’s integration experience with PAS Systems in use and Arrendale’s ability to custom engineer an interface to the Ireland’s national Healthlink project. St. Vincent’s University Hospital and St. Vincent’s Private Hospital utilize Arrendale’s TA+ modular clinical documentation software system to meet their complex workflow requirements. Dictating physicians now have a variety of dictation input options, including digital recorders, PC attached microphones, smart phones and tablets. Voice files are centrally-stored enabling referring and attending doctors to call in and listen to voice dictations. SVUH secretaries utilize Transcribe+ word processing, speed typing, built in medical spellchecker, automatic copies, envelop generation and more. Typed letters are available for electronic signature and delivery via HL7 into SVUH’s EHR. Transcription options include enhanced Dragon speech recognition support, with options to self-edit or send to the Secretary for editing. Irish hospitals using the Transcript Advantage (TA+) software platform maintain departmental autonomy with regard to letter appearance and delivery options while enjoying a searchable repository of all transcripts. Departments can be configured with a one-to-one relationship between physician and secretary or with specified typing teams for each specialty. GPs have the option for integrated Dragon front-end speech recognition and may sign their letters on mobile devices or their PCs to increase efficiency and improve patient care. Capturing dictation digitally is only the beginning. Additionally Arrendale supports and enhances Nuance’s Dragon speech recognition experience. Imagine you are away from your desk, making rounds and visiting patients. You create voice dictations from a smart phone or recorder throughout your rounds. Upon returning to your workstation with Arrendale’s Speak-EZ+ application, the day’s dictations are waiting as draft letters, having already been converted to text by Dragon. You then review, edit and electronically sign in a single step, dramatically shortening the documentation cycle. With Speak-EZ+ GPs have the ability to “Bypass” the letter if more information is needed or to “Send to Transcription” for traditional handling by a medical secretary for those difficult cases or tight schedules. Our solution goes beyond typical Nuance Dragon functionality by saving the voice file, including e-signature, producing statistical reports and delivering transcripts to your electronic record. Our US Support Center answers questions around the clock to serve worldwide customers via toll-free calling, email and on-line support. We look forward to providing more details on how ‘across the pond’ hospitals and trusts can maximize the benefits of their technology budgets with TA+ digital dictation software. Call 800-817-322 toll-free to speak with an Arrendale sales team member.